Accessories - Dogs - Page 1 - TSO Products LLC. All DoubleGroove™ Dogs are sold in pairs (purchase "1" quantity and you will receive two dogs). To secure your DoubleGroove™ Dogs, consider adding our SpeedKnobs™ (sold separately). We think you'll find these knobs to be far and away the fastest and easiest-to-thread option; they're the best we've ever tested. 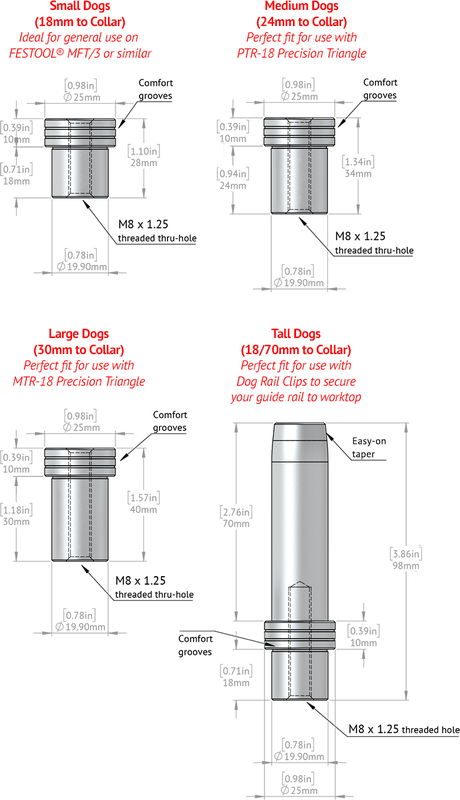 We've reinvented the modern 20mm bench dog and, in the process, addressed some common frustrations. Having dealt with our fair share of ill-fitting or "stuck" dogs, we've designed our dogs with twin grooves that run along the collar. While it may not seem like much, these double grooves make it much easier to remove the dog once it has been installed. Sharing the same careful attention to detail that has set our precision tools apart, small but important design elements—like the tiny undercut beneath the collar that guarantees a perfect 90 degree transition, even if the holes in your work surface aren't perfectly devoid of tearout, or slight chamfers along the touchable surfaces—result in a tool that's comfortable, accurate and a pleasure to use. DoubleGroove™ Dogs are sold in pairs, and come in five sizes: Small (ideal for most general use applications), Medium (for use with our PTR-18 Precision Triangle or thicker work surfaces), Large (the product on this page, for use with our MTR-18 Precision System Triangle), Tall (for using in conjunction with Dog Rail Clips to secure your guide rail to your worktop), and Stubby (also designed for use with Dog Rail Clips, but with a shorter height to clear your track saw motor housing when plunge cutting). Additionally, specialized "Close Fit" versions of our Small Dogs and Tall Dogs are available for those who want a tighter fit in 20mm worktops made with precision tools (e.g. CNC router or the Parf Guide System). Easier to Use: Twin grooves running along the collar make DoubleGroove Dogs easier to remove than other dogs on the market; no more stuck dogs! A Perfect Fit: Precision machined to exacting tolerances, with a diameter of 19.9mm to strike the perfect balance between solid, secure mounting and ease of insertion/removal. Ideal for Custom Worktops: If you've made your own perforated worktop based on the 20x96mm standard and aren't quite sure if your tolerances are perfect, you'll likely find DoubleGroove Dogs to be a better choice. Their twin collar grooves will make it easier to remove dogs that might become "too snug," and a swept undercut along the collar means DoubleGroove Dogs will mount flush even if your holes have tearout. A Great Companion: Our DoubleGroove Dogs are the perfect companion to our PTR-18 and MTR-18 Precision Triangles. Select the medium size for use with the PTR-18, or the large size for use with the MTR-18. See DoubleGroove™ Dogs In Action! 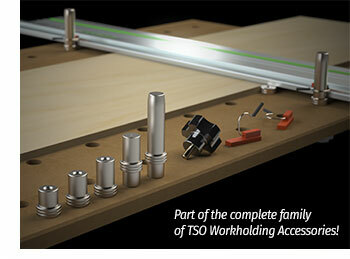 DoubleGroove™, SpeedKnobs™, PTR-18™ and MTR-18™ are trademarks of TSO Products LLC.